How lovely and whimsical is this set? Baroque Motifs is just one of many sets on the retirement list this year. Order yours today before it's gone for good. You can order Baroque Motifs (set of 6) until May 31; but don't miss your chance. You can create beautiful cards and gifts with this set. Here is an example of one of my favourite cards using Baroque Motifs. 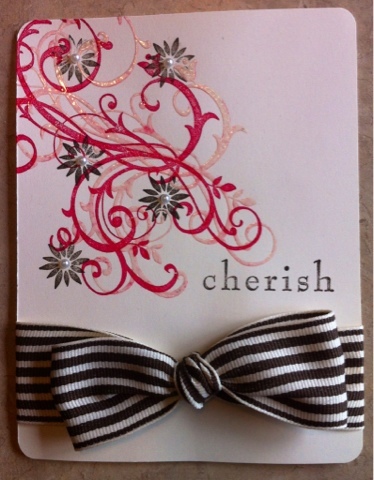 This super simple card is elegant and beautiful. I used very vanilla card stock, rose red and early espresso ink, Versa mark ink and clear heat emboss powder. The image was stamped first in the rose red, then stamped again in Versa Mark slightly offset. The clear embossing powder was sprinkled over the Versa Mark and set using the heat tool. I then stamped the flowers over top in early espresso and added a basic pearl embellishment to the centres. I then completed the look with our stripped 1 1/4" grosgrain ribbon in early espresso.